Bosch has made it easy to select from six different cotton wash programmes. The different programmes allow you to quickly pick the desired temperature for your load without having to adjust any other settings. In addition to the large range of programmes, there are also options that customise each wash. Press the Aqua Plus button and a higher water level is used during the wash and rinse cycles, ensuring maximum detergent removal - ideal for those with sensitive skin. The Reduced Ironing function adds a gentler spin during the programme and at the end of the spin cycle to reduce creasing. 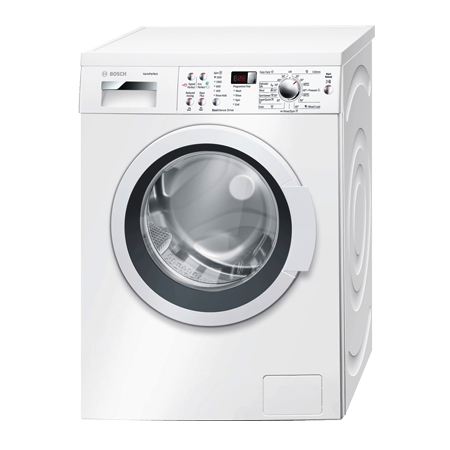 The WAP24390GB has some additional features that help make doing the laundry that little bit easier.The self-cleaning detergent drawer has smooth walls and jet sprays in each corner to automatically flush away any lingering detergent during each wash.
You also wont have to worry about wandering fingers disrupting the cycle, as this Bosch washing machine comes with its own child lock.